WHAT DOES one expect as soon as he is freed from the wards? Four things that immediately pop up when one is at the ER: True post-duty status. More time to sleep. No Guazon and afternoon endorsements. No rounds with consultants. The patient turn-over is faster. One has to handle patients for 12 hours before the next band of interns comes along. The hardest thing to do is facilitating the labs and scheduling the imaging modalities; the patients who come in usually don't have the funds to have these settled. It is frustrating, for what else can one do without the benefit of a complete blood count or a urinalysis, for example? The fact that PGH now charges for everything, including the most basic of labs, even aggravates the situation. On the other hand one gets to handle "virgin" cases--that is, patients who haven't been started on any medications yet. Often they present with symptoms one normally reads in books, but they may also present with weird symptoms not usually described in books. Some patients come in as diagnostic dilemmas; they've been to many hospitals for the past years, but nobody really knows what their conditions are. The experience at the PGH-ER is overwhelming, and the clinical pearls one acquires are priceless. 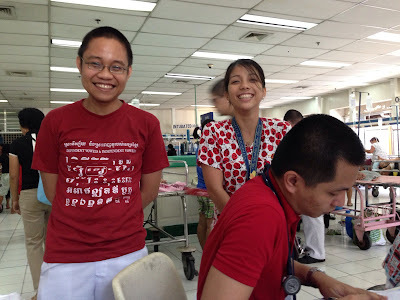 The Physicians-on-Duty (PODs) during my tour of duty were a joy to work with. I will remember Dr. Eds Gonzales, who was the resident-in-charge (RIC) of most of my patients. We joke around that he looks like the model Derek Ramsey. At certain angles he certainly does, but not as bulky perhaps? I admire him for his calm. For a patient with fluid in the lungs he let me perform a thoracentesis, where we drained about a liter of the urine-colored substance. With my old friend Coy Cabanilla, whose hyperactivity was infectious. Dr. Kenn Samala was with us, too. Gracious and kind as always, he taught us how to read the ECGs even if he had a lot of other things to do. Dr. Anton Faltado was funny, often bursting into song, the most memorable of which was an uplifting rendition of "Smelly Cat," a song he picked up from a Friends episode. Dr. Jesi Bautista, the neurology rotator, joined us in our quest to find the perfect milk tea. She now has wavy hair and therefore looks like Thalia. Notwithstanding the stench, humidity, and noise, I was sorry to bid the ER goodbye. THE MEDICAL ICU (MICU) was what it had promised to be: a place to unwind and catch up on sleep. With at most two patients to handle (and with a co-decked clerk at that), we had all the time in the world to drift to dreamland. It was a lot like the Houses of Healing in The Lord of the Rings, where wounded travelers--in this case, interns--come to rest their bodies and souls. PRAISE GOD for helping me through the oral and practical (OSCE) exams. The oral case was on chronic obstructive pulmonary disease. I found the OSCE more challenging, though, and it was during the patient education station where I messed up.